Your service is courteous, prompt and excellent! Thank you for the recent installation. I am very pleased and will not do business with any other company. Your check is in the mail, and thank you again! The number of calls we get each year ranging from homeowners to churches to small and large business that have one or more units stolen or damaged from thieves is unbelievable. HVAC theft happens more often than you may realize, but there are plenty of steps you can take for theft prevention. How Do You Prevent Unit Theft? One solution is a metal cage attached to the ground with a keyed entry system for servicing. These are relatively inexpensive but unsightly and not 100% theft proof. The picture to the right is one example, but we offer a few different types as well as RTU mounted systems. Max Mechanical Is Proud To Provide CopperWatcher™. Another option is to install a theft prevention service like CopperWatcher™. 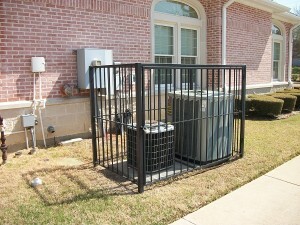 When a thief attempts to steal the parts of an A/C unit, they typically begin at the disconnect next to the unit where they will trio to shut down the high voltage power. Even thieves don’t want to be electrocuted. The CopperWatcher™ system reliably monitors those connections that the thief will try to cut so they can extract whatever parts they want. CopperWatcher™ works by monitoring the power supplied to the A/C unit. If the power is somehow shut down, then your CopperWatcher™ system will communicate with your current burglar alarm unit. The signal sent by the CopperWatcher™ system will trigger the siren of your burglar alarm and draw all available attention to the cowardly thieves. You might now be wondering if there is the possibility of sending a false alarm. That’s understandable; false alarms can be annoying, and even a little costly if there are city and alarm company fines involved. Don’t worry, though, the people at CopperWatcher™ thought of that already. Their system can discern between an intentional shut down and an overall power outage. Not only are you safe from theft with this system, but you’re also safe from accidents. In the instance a power outage take place, CopperWatcher™ draws power from the backup battery of your current alarm system. The theft can be detected by a pressure switch that has been specially designed, and patented, by CopperWatcher™. Any pressure loss around the switch will cause your alarm to sound and the theft to be stopped. CopperWatcher™ can work with many different systems, just let us know the details of your system, and we will see if they meet specific requirements and specifications. Contact us for more information about a cage for your residential or commercial property or the CopperWatcher™ Alarm system today!